A drop-in session takes place next week to give the public a chance to see how the Hawick Flood Protection Scheme will look. Members of the public are invited to come along to see the final design on Wednesday 27 March between 1pm and 8pm at Hawick Town Hall. Information will be available on how the design has been finalised through the Community Vision Working Group’s involvement. This will include final wall heights and finishes, proposed new footbridges and combined footpath/cycle path, replacement community greenspace areas and the public art project. Residents will also have the opportunity to speak to flood scheme team members and our officers on topics including the community timber project and environmental health. Members of Sustrans Scotland will be available to discuss the major investment in a sustainable travel network which it is delivering in partnership with the flood scheme, which includes pedestrian and cycle pathways, new bridges and associated infrastructure. 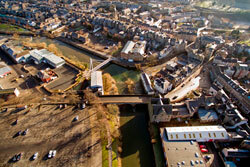 The Hawick Flood Protection Scheme will deliver protection from a 1 in 75 flood event to over 900 residential and commercial properties at risk along the River Teviot and Slitrig Water. The Scheme will also deliver multiple benefits to the town of Hawick, maximising the cultural, heritage, educational, environmental, energy and health opportunities in partnership with the community and external organisations. This has included the creation of Community Vision and Traffic Management working groups to ensure key community stakeholders can help shape the project. “The drop-in session is the latest in a series of proactive engagement events held by the Hawick Flood Protection Scheme over the last four years with the public, community groups and businesses. “There will be information available on a variety of aspects of the scheme and as it is a drop-in session, people can stay for as long as they wish. Images are available on our Flickr page. Hawick Flood Protection Scheme is being delivered in partnership with Scottish Government who are providing 80% funding of all eligible elements, with the remaining 20% funded by ourselves. Further details on the Hawick Flood Protection Scheme are available on their Facebook page or our website for more details on the community timber project, which is open to local groups from across the Scottish Borders to apply to put trees felled during the scheme to good use.